Space pirates do all kinds of jobs the official military can't officially do themselves. 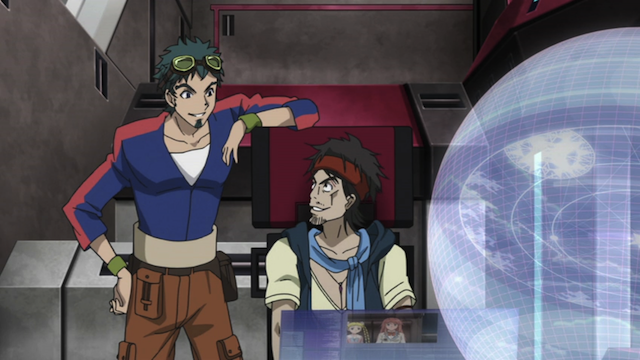 Episode 8 of Bodacious Space Pirates (Mouretsu Pirates) kicks things up a notch. As many had guessed, the mysterious stowaway created some complications for the crew of the space pirate ship Bentenmaru, and gave an indication of where the plot is going (at least for the next couple of episodes — that is for this arc). We also got our first formal introduction to the Bentenmaru’s bridge crew. First the stowaway is revealed to be Princess Gruier of the Serenity family. We also learn a couple of other things: Aristocracy is alive and well in the future, in fact the Galactic Empire is ruled by a royal family whose history runs over a hundred generations. Second, in the future, some princesses will be named after types of cheese. Also insurance companies will be named after silent film stars. The princess and the pirate. Princess Gruier came aboard the Bentenmaru to ask a favor, however she didn’t realize that the former captain, Marika’s dad, was dead. As we wonder about the sort of jobs the pirates have been taking, it is instructive to consider that the princess was confident enough that the former captain would have accepted her request that she snuck on board and demanded to speak with him. The Princess’ request is that the Bentenmaru hunt down a ghost ship, “the wandering golden ghost ship”. 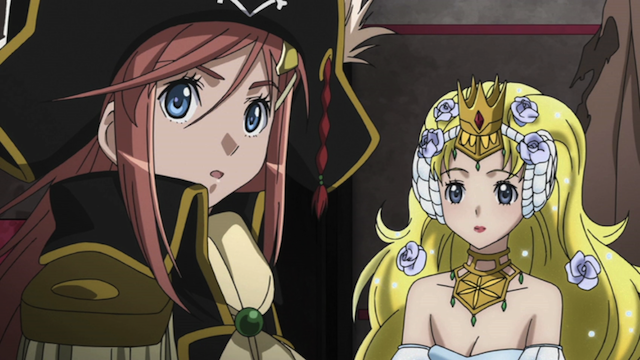 Several episodes back Marika and Chiaki thought they had detected a ghost ship, and reported it to Kane. Chiaki asked Kane straight out if he had ever encountered a ghost ship himself, and he gave a response like, “It’s hard to know”. At any rate, Marika accepts the request, even though (or, perhaps, because) the royal court of the Serenity family is publicly reporting princess Gruier’s disappearance as foul play. Apparently there are different factions in the court, and someone doesn’t want the princess to find out the truth behind the ghost ship. Misa, Marika, and Kane on the bridge. Having a visitor provides an opportunity for formal introductions of the bridge crew. This reveals that some of my earlier guesses were off at least a little. In particular, Luca is the navigator, I had lumped that responsibility together with Kane’s role as helmsman. 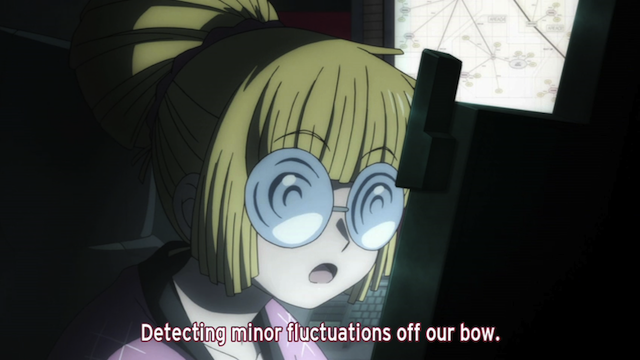 Further, I had guessed that Luca was a sensor specialist, but that responsibility falls to Hyakume. Finally I had guessed that Hyakume and San-Daime shared responsibility for engineering and system maintenance in some way, but San-Daime seems to have sole responsibility. Sometimes things don't go according to plan. 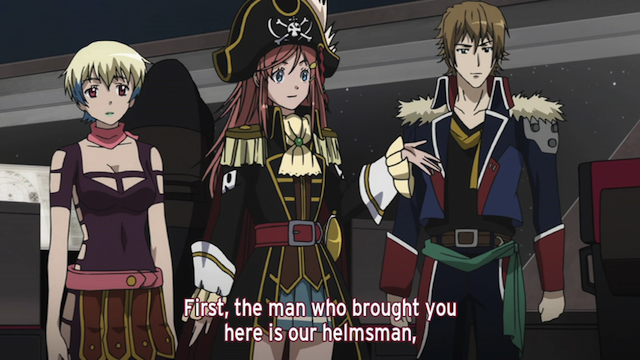 As the episode ends, another kind of pirate mission is shown. A ship is about to enter the Sea of Morningstar’s star system, but it is a combat vessel owned by the Serenity royal family. This causes problems for the regional government: they can’t ignore the appearance of a combat vessel owned by a foreign power, but the Serenity family is technically an ally (part of the same Galactic Empire). The Sea of Morningstar’s government doesn’t want to send one of their own military craft, but they do want to investigate, “so they turn to the pirates”. This is a very plausible use of the privateers, and indicates that there are many other types of jobs beyond the “adventure travel theater” jobs they have been picking up from Harold Lloyd Insurance Union. Coorie is always calm under fire. Princess Gruier has requested documents pertaining to the Golden Ghost Ship, so the Serenity combat vessel isn’t a surprise. As the Bentenmaru arrives to rendezvous with it, however, they find that it has been under attack, and the attacking vessels appear to be additional military craft from the Serenity royal family’s fleet. 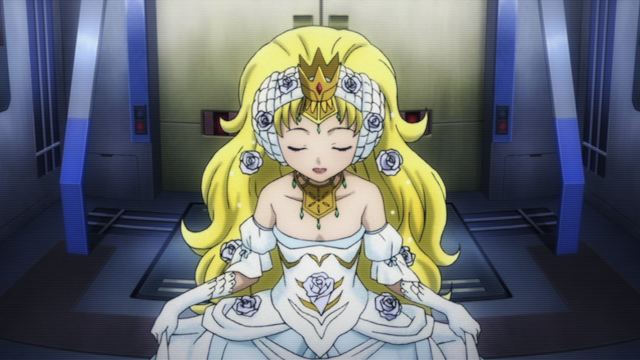 The episode ends before the situation is fully clarified, but it appears that someone in the court knows that the princess requested the documents related to the Golden Ghost Ship, and are willing to take extreme measures to stop her from solving the mystery. The preview indicates that next week will see the return of some old friends! It isn't always easy being a princess. 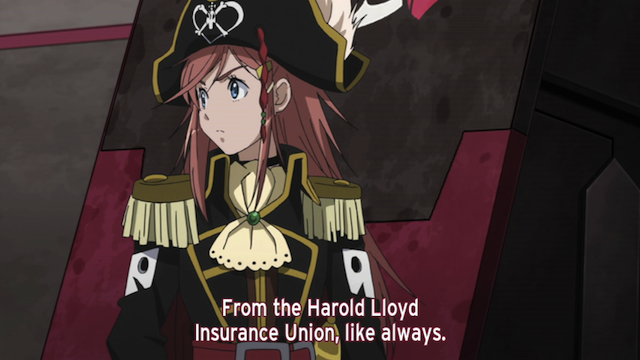 Harold Lloyd Insurance Union seems pretty fishy, or maybe smell like rats -- either one, really. By the way, he's a cyborg. Another entertaining and informative episode, giving us some more background on things. It’s interesting that the Princess seems to have known Marika’s Dad well — and liked and trusted him A LOT — but was unfamiliar with any of his crew. So under what circumstances did they get to know each other, one wonders. Also, did you think it odd the way Marika responded to the Princess’ suggestion that she’d like to wear the Captain’s uniform? Everything had been pretty light and friendly until that point, and then Marika suddenly seemed irritated and ordered everybody back to their posts. Considering everything we know about the stress she’s under, and how hard she’s struggling to live up to her mother’s standards and be worthy of the uniform, I can see how she might be just a little bit touchy on that point. From everything else we’ve seen about her, it seemed an uncharacteristic response. Yeah the points you mention are interesting. I just don’t know what to make about them. Another moment that I didn’t touch on, but fits the theme of what you are talking about in a way, is the moment when Marika is talking to her mom, and her mom suggests inviting the princess over. Again Marika’s negative reaction could fit with a desire to keep the princess out of her family life. On the other hand, it could be something else, like her mom was thinking that Marika could learn something from the princess about handling herself (her responsibilities as a captain make her have to act a certain way, no matter the pressure she is under), or possibly Marika’s mom knew the princess. First things first. 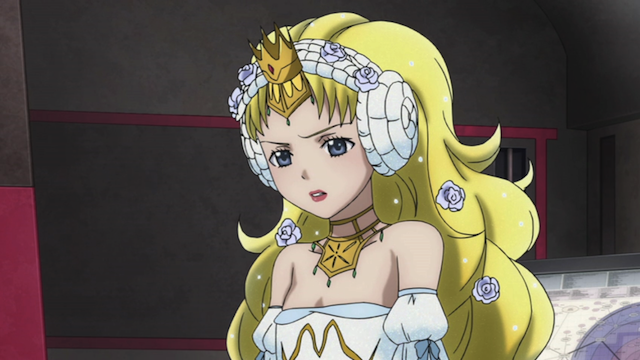 Am I the only one that noticed the striking similarity between this princess and Usagi Tsukino from Sailor Moon? If someone showed me Gruier the way she looked when introduced to the class and told me it was from a re-boot of Sailor Moon, I’d believe it. They’re virtually identical, right down to the little hairs at the ears and neck. 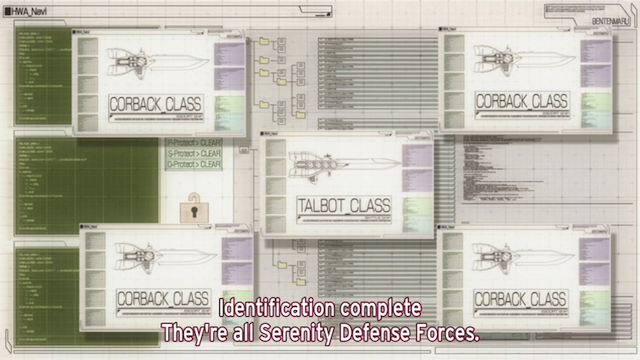 I’m guessing it was a deliberate reference to “Princess Serenity” of Sailor Moon. As for Marika’s reactions to the princess in certain scenes, I don’t think it’s irritation or anger or anything like that, she blushes too much each time. I think it’s a combination of self-consciousness and embarrassment. Remember, there’s an implied idolization of royalty going on, judging by what Mami was saying, and the way everyone seemed to be so interested in the princess. It’s a class thing. 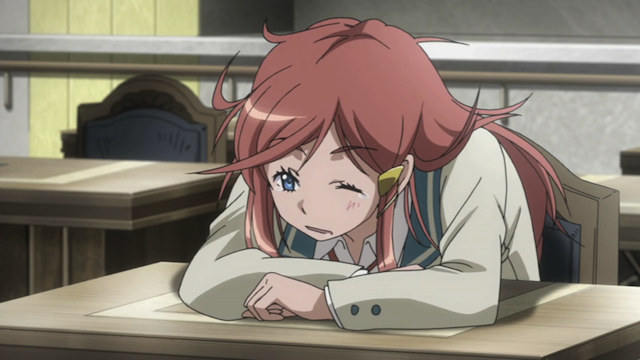 Marika, and just about everyone else, is reacting like most Japanese would when interacting with the Imperial Family. 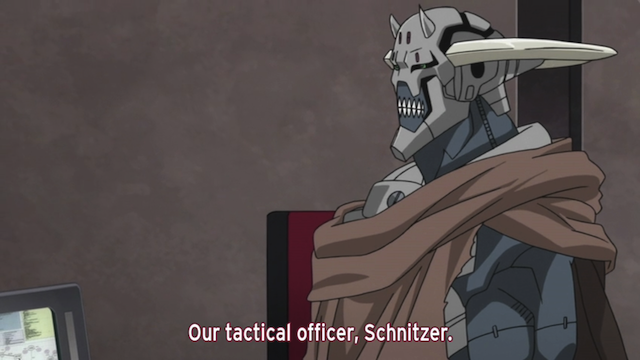 I’m expecting the Barbarossa will play a part in the next episode, perhaps as back-up for the Bentenmaru. I have a very strong suspicion that Chiaki’s conversation with her father on the phone is connected to this. Looking at the next episode preview, a big part of me is rather hoping the Yacht Club gets involved, perhaps using the Odette II’s superior CIC capabilities to assist the pirates. Also, I wonder if the insurance company is a double reference. One for a famous film star, and the other for the world’s most famous insurance company, Lloyd’s of London. Unfortunately I only ever caught about two episodes of Sailor Moon, so any of those references go over my head. Now that you point it out though (and a quick web search), I would have to say the reference would be obvious to a Japanese audience. I’m looking forward to seeing how the other characters get used next week. I think you are right that Chiaki’s phone call with her dad was connected to all of this somehow. I did read somewhere — sorry, I can’t remember which site right now — that they intentionally changed the look of the Princess from how it appeared in the manga as a sort of tribute to the Sailor Moon character (a show which I never watched either). That’s kind of cool. Regarding the scene in discussion — you could be right. So far I’m the only one (of those I’ve discussed it with) who seems to think it was a sign of irritation, but…her expression and tone just seemed more consistent with “irritation” than “embarrassement” to me. Especially considering the reaction shots of the Princess and Misa. If I’m right, they’ll go back to that at some point. If I’m wrong, then…nevermind. It is pretty tough to say what the idea behind that particular scene was, because we have so little information on the princess as yet. THAT Anime blog has a theory that she can’t be trusted, and they point to all of the shots of Misa standing silently as support. I think her reason for wanting to wear the hat is just as likely that she met Marika’s dad when she was a small child and maybe he let her wear the hat. She seems to have fond memories of him at any rate. So how would Marika respond to someone who knows her father better than she does? Interesting question there regarding the Princess and Marika’s dad. Probably the one character note in the show that didn’t seem “realistic” was Marika’s lack of emotional response at finding out about her father. And yet it’s not an oversight, because Marika actually comments on it herself in the one scene where she’s riding in the car with her Mother. Very odd. There have also been a couple of cryptic remarks from Misa concerning Marika and her circumstances / motivations. I think we’ve just begun to scratch the surface of things here. And I love that. And, I might point out that Misa made a comment about Marika’s motivation in the first episode of this arc, so that might have been explicitly pointing to a major issue that would be tackled during this set of episodes.